Carrying a balance from month to month on a high rate credit or store card can cost you literally hundreds of dollars in interest every year. 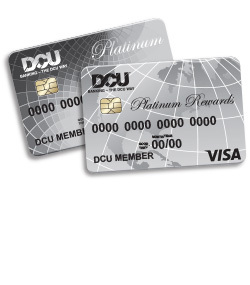 With interest rates way below the national average, a DCU Visa Platinum card can save you money every month. Plus, we don't charge a monthly or annual fee. Pay off those high rate bank and store credit cards with a balance transfer to your DCU Visa Platinum. You'll get the same low rate on balance transfers as you do on purchases. Transferring a balance to a low rate DCU Visa Platinum Card has never been easier than it is with our Online Balance Transfer option in Account Manager. Enter the card number and amount that you're paying off, verify the card issuer information, and we'll take care of the rest! Whether you're paying off another Visa, MasterCard, American Express, Discover, or even a store (Best Buy, Target, Walmart, Kohl's, Apple, etc.) card, you'll receive notification if your balance transfer was successful. 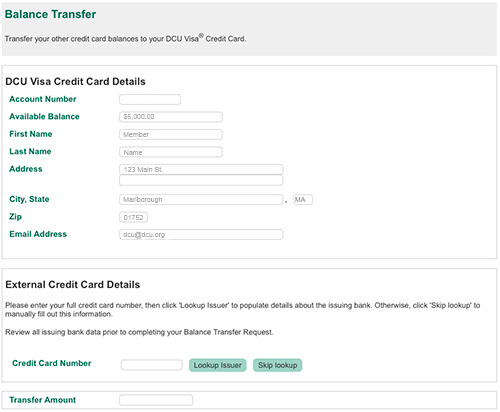 Once your balance transfer is complete, you'll see the requested amount added immediately to the balance of your DCU Visa account. This will show up as a Cash Advance on your monthly statement, but rest assured that you're still paying the same low rate as you would for regular purchase. After the transfer, be sure to keep an eye on the account that you are paying off. While most transfers will happen in a matter of a few business days, others may take longer depending on how the card issuer processes its payments. Don't Have a DCU Visa Yet? Apply today online, in a branch, or by phone. Once your Visa account is open and active, you'll be able to initiate balance transfer immediately.